Eyes on Main Street is a large outdoor and indoor photography festival in Wilson, North Carolina. We are a Non-Profit Organization and donations are tax deductible as stipulated by the IRS. Carol Johnson, former photography curator at the Library of Congress, Washington D.C. 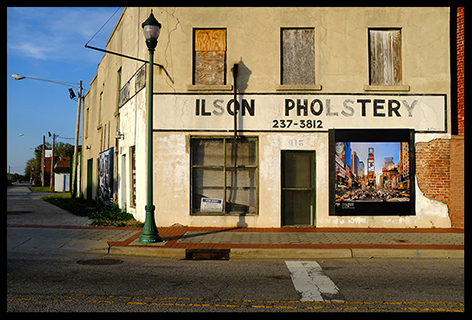 The fifth edition of Eyes on Main Street, Wilson Outdoor Photo Festival opens April 27, 2019 in historic downtown Wilson, NC.Nash Street, our main street, and the 100 block of Tarboro Street, will be transformed into vibrant galleries of large-scale photographs. For 100 days, 100 photographs will be displayed on 100 storefront windows, spanning seven city blocks. The exhibit will take visitors across the railroad tracks linking east and west Wilson into one shared community. Focusing on the theme of “Main Street:A Crossroad of Cultures,” the exhibition, curated by Jerome De Perlinghi and co-curated by Ghadah Alrawi and Carol Johnson, features the work of 100 photographers from 45 countries with an equal number of men and women. Among the artists included in this years' edition are: Bruce Gilden, Bieke Depoorter, William Klein, Meeri Koutaniemi, Carl De Keyzer, Donna Ferrato, John Stanmeyer, Renée C. Byer, Martin Roemers, Susan Barnett and Juan Arredondo. The Eyes on Main Street festival will launch on Saturday April 27, 2019 with a street party on South Street in collaboration with 217 Brew Works, our local brewery, across from the Vollis Simpson Whirligig Park. Over 30 international photographers will be present at the launch of the fifth edition. The exhibits will run until August 4, 2019. Over the 100 days, a number of events will be held to celebrate Wilson’s commitment to the arts including a set of lectures during opening weekend by photographers, Bieke Depoorter, Riccardo Bononi, Shane Hulbert, Robert Nickelsberg, Keith Dannemiller and Juan Arredondo. On Friday May 3rd, 2019, a photo fair and sale will be organized on the 100 block of Tarboro Street. At this new event, photographers, artists and vendors will sell art and objects related to photography. The Eyes on Main Street Festival celebrates its fourth year of partnerships with Columbia College Chicago Alumni Association and Canon USA, Inc.’s “Rebel with a Cause” initiative. Peter Fitzpatrick, our Education Director and Professor at the School of Fine and Performing Arts of Columbia College Chicago, will supervise senior photography students and alumni who will travel to Wilson to conduct after school workshops for more than 100 Wilson youths. The workshops begin on April 21st, one week prior to the festival kick-off. The Festival will exhibit a selection of photographs shot by 13 resident photographers who each spent a month photographing Wilson from a wide variety of artistic viewpoints. Between April 2018 and February 2019, the city attracted resident photographers from around the world, including Amsatou Diallo, Kajal Nisha Patel, Sandeep Biswas, Giovanni Urgelles, Jared Ragland, Ximena Echague, Seydou Camara, Dave Jordano, Jérôme Bonnet, Andrea Torrei, Çiğdem Üçüncü Serra Akcan and Alice Kayibanda. Examples of their work will be on display at 231 Nash Street East, corner of Douglas Street and Nash Street, across from the Imagination Station. Building on the fourth edition of the festival, 60 large-scale photographs shot by the Wilson youth during the 2018 Workshop will be exhibited in an outside gallery across from the Vollis Simpson Whirligig Park on the corner of South Street and Goldsboro Street. The 2019 Kids Indoor Gallery will be exhibited at 203 East Nash Street where you can view the work of this year’s Kids Workshop. Columbia College Chicago and Canon USA host this exhibit. “Eyes on Australia” will present the work of six contemporary Australian women photographers focusing on Australia. Featuring: Hoda Afshar, Marcelle Bradbeer, Tamara Dean, Jasmine Poole, Raphaela Rosella, Prue Stent and Honey Long. The photographs will be on view at 128 Goldsboro Street’s new permanent gallery.